Article by Ron Sherman, GRI Engineering & Development, Inc. Brake technology is one of the greatest contributors to the presence of noise, vibration, and harshness (NVH) in vehicles; however, top-quality brake technology can successfully control NVH to give a safer, more comfortable ride. Friction formulations and shim technology are particularly critical to automotive NVH control, as is getting a complete brake job, including rotor replacement or resurfacing, each time pads or other brake components are replaced. The term NVH came into popular use in the automotive brake industry about 20 years ago. At that time, friction formulations and other aspects of brake design were changing in response to issues of rotor pulsation and significant premature rotor wear. Older friction materials caused rotors to wear out prematurely, which in turn caused vibration that could be felt by drivers. Around this time, OE brake manufacturers also decided to make rotors thinner to save on material costs. Rotors feature fins in between inner and outer plate layers. The plates on the outside of the fins get worn down little by little while braking, and the fins expand and contact based on the heat generated by braking friction. As a result, the plates wear evenly at the high temperatures caused by braking, but once the brakes cool back down and the fins contract, the rotor surface becomes uneven, with small peaks and valleys apparent at ambient temperatures. When brakes are still cold – for instance, when a driver has just started up the car, before the brakes have generated enough friction to warm up – the uneven surface of the rotors comes into contact with the flat brake pads, which can cause the front end, steering, and/or brake pedal to vibrate and sometimes generate noise. This accounts for brake noise that is primarily noticeable when first starting a car. A visual inspection of rotors worn in this way that are causing vibration will often show scoring. Once rotor design was changed to be thinner, friction formulations needed to be changed as well, as the highly abrasive formulations of the past would cause even more vibration with thinner rotors that wear out more quickly. New friction materials were developed that are softer and work in conjunction with rotor design to minimize vibration and noise. NVH control is at the forefront of modern automotive brake design, as brake manufacturers strive to provide customers with the quiet, comfortable ride performance they expect. Though heavy vibration can affect brake safety, as it can affect steering stability particularly while turning, noise elimination is of greatest concern for automotive brake manufacturers. Drivers expect brakes to operate quietly, and can be distracted or frustrated by noisy, vibration-prone brakes. Two components aid in the control of NVH for braking: the friction material and the shims, which are small rubber or adhesive components that fit between other brake components (notably, the pads and rotors) to reduce noise and vibration. Friction materials work in conjunction with rotor design to minimize vibration and noise by damping vibration and noise harmonics. Shims also aid in noise and vibration damping, and their design and formulation can be as advanced as that of the friction materials. Friction formulations are proprietary and unique to each brake manufacturer, and so it is important to purchase brake products from industry-leading manufacturers if NVH control is a priority. Take, for example, Bendix Brakes. 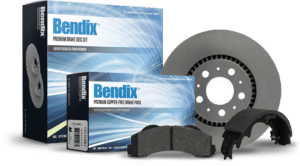 Unlike most automotive brake manufacturers, GRI Engineering & Development, Inc. (GRIE) manufactures all of the components for the Bendix Brakes brand of automotive brakes, including shims. While other companies are driven by cost and availability in the marketplace when purchasing shim technology, GRIE is able to focus primarily on designing and manufacturing shims that utilize industry-leading shim materials to eliminate the noise and vibration frequencies generated by braking. Additionally, the company delivers friction technology that is state-of-the-art and is proven to meet or exceed OEM specifications and therefore customer expectations. Ultimately, every part of the braking system works together to eliminate NVH effects: calipers, caliper hardware, backing plates, rotors, shims, and friction formulations. Automotive brake manufacturers like GRIE, which has a long history of working with all of these components together rather than manufacturing just a single component of the system, are more able to ensure that all of the parts of the brake system work together to eliminate noise and vibration from braking. Just as manufacturers who work with every part of the brake system are more capable of managing NVH, performing a complete brake job is also key to controlling noise and vibration. 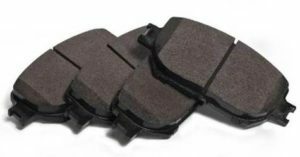 Even if you are replacing your brake pads with pads that have been expertly engineered for quiet performance, if your rotors or shims are worn down, noise and vibration can occur. This means that when changing brake pads, rotors should either be replaced as well, or, if the rotors are still within specifications, should be thoroughly cleaned and resurfaced. The caliper and caliper hardware, piston, seals, and other components should be checked to ensure that they are all working properly and are adequately lubricated. 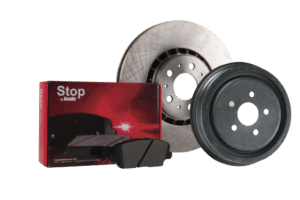 Opting for a complete brake job when it is time to service your brakes is the best way to ensure that all components will work together for noise-free braking. Attempting to cut costs by not replacing or resurfacing rotors will almost certainly lead to noisy, uncomfortable braking. Ron Sherman has almost twenty years of experience in the aftermarket as a Friction Engineer. Ron’s grown up in the industry, having been involved in every step of the process from backing plate stamping to developing formulations throughout his career. Ron’s currently the Engineering Manager of Friction Products at GRI Engineering & Development, Inc. Formed in 2002, GRI Engineering holds a significant market share of the aftermarket braking segment. In addition to a complete line of brake rotors, drums and friction components, GRIE is known for its highly precise casting and machining operations. With operations in China, GRIE has created a reputation for supplying high quality finished machined components to the off-road and heavy-duty vehicle market. MAT Holdings is a diversified, privately-held family company with a portfolio of companies that manufacture, market, and distribute quality products and trusted brands to the hardware and fencing, automotive, and power equipment industries. MAT Holdings Inc. was formed in 1984 as Midwest Air Technologies Inc. with its current headquarters located in Long Grove, IL. Today, the company has grown to include six subsidiary companies within the U.S. and twelve worldwide and employs roughly 13,000 people.